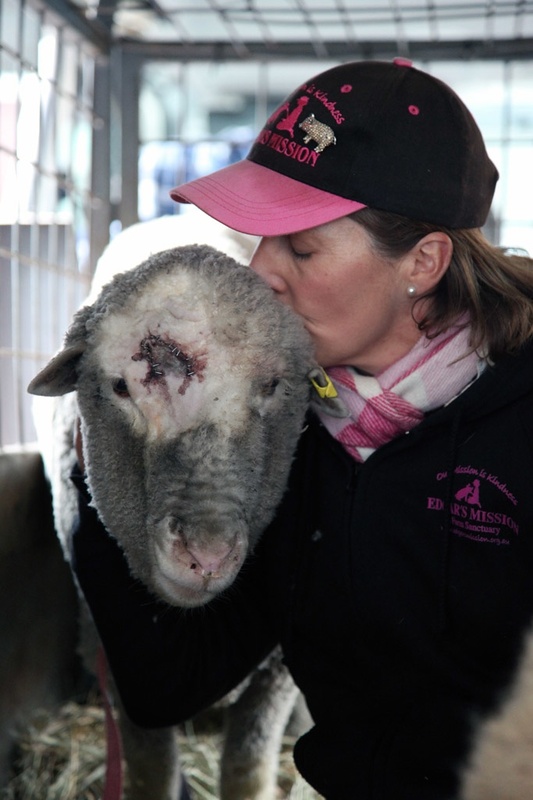 The sole survivor of the tragic truck accident in Melbourne’s west, which killed 399 sheep, has gone to her new home at Edgar’s Mission today! Molly Brown’s story has touched people all over the world and The Lost Dogs’ Home has been inundated with emails offering to adopt the small ewe. However, given the Home has worked with Edgar’s Mission in the past — Melbourne’s famous runaway goat, Calamity Jane, was adopted by the charity earlier this year — the farm was the natural choice for Molly to spend the rest of her days. “Edgar’s Mission is a wonderful organisation and we know all our animals that go out to live there have the best lives possible,” said General Manager Sue Conroy. EM’s director Pam Ahern, her team, and a very large and friendly sheep named Timmy arrived at the Home around midday to meet their newest addition. Pam said she frequently brought Timmy along for collecting sheep, as his calm nature had a positive influence on the often distressed sheep. As for Timmy, Pam said he doesn’t mind being the welcome wagon for EM’s woolly residents. “As long as there is food involved, Timmy is only too happy to come along!” she laughed. Those who were hoping to adopt Molly Brown went from disappointment to happiness when they heard where she was going to live. Pam said she was overwhelmed by the support Edgar’s Mission has received. “We’re so touched by the faith people have in what we do,” she said. “Molly Brown is a symbol of hope to everyone who was traumatised by the accident. On behalf of Molly Brown, The Lost Dogs’ Home would like to thank all the well-wishers who wrote to us while she was in our care. We couldn’t be happier with the outcome and wish the beautiful girl all the best in her new life at Edgar’s Mission.